1. 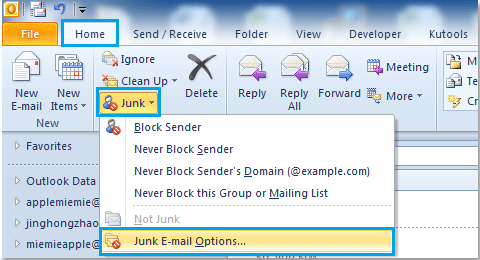 In Outlook 2010/2013, click Home > Junk > Junk E-mail Options. Note: In Outlook 2007: click Actions > Junk E-mail > Junk E-mail Options. 2. The Junk E-mail Options dialog will then show up. There are four different levels of junk mail filter settings, please choose the level you want and click OK.
• No Automatic Filtering: This option can block messages from addresses which have been added to the Blocked Senders list. • Low: This level will only filter the most obvious junk. • High: Filters all messages suspected as junk. • Safe Lists Only: Any message that is sent from someone not on your Safe Senders list or to a mailing list on your Safe Recipients list is automatically considered as junk email. 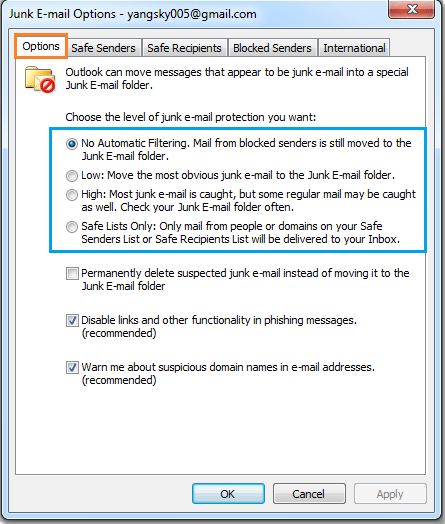 There are five different junk e-mail filter lists in the Junk E-mail Options that can determine whether the emails will be moved to the junk folder or not. • Safe Senders List: Email addresses and domain names of the senders in this list are never treated as junk. 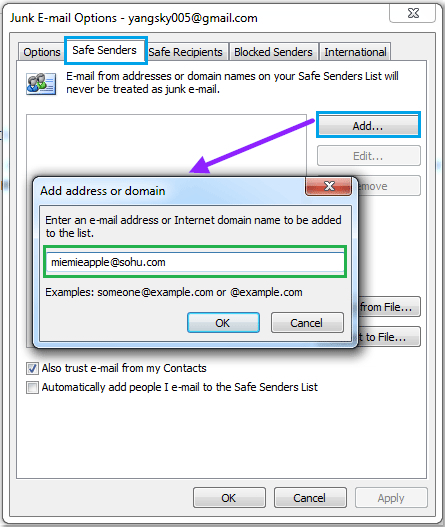 • Safe Recipients List: You can add addresses and domain names from the mailing lists and distribution lists to this list so that they will never be marked as spam. • Blocked Senders List: If you add an email address or domain to this list, messages will automatically sent to the Junk Email folder. • Blocked Top-Level Domains List: You can add country/region codes to this list to block messages from another country or region. • Blocked Encodings List: To block messages that contain special encoding or character set, you can add encodings to this list. 1. Click Home > Junk > Junk E-mail Options in Outlook 2010/2013, and click Actions > Junk E-mail > Junk E-mail Options in Outlook 2007.